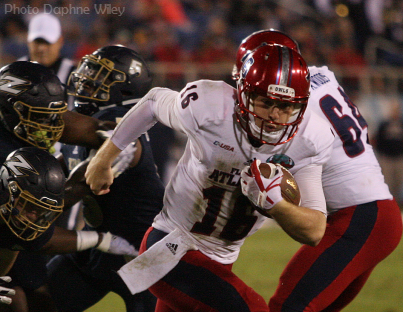 FAU football put the finishing touches on their best season to date at the FBS level with a 50-3 victory over Akron in the 2017 Boca Raton Bowl before an announced attendance of 25,912 and a national television audience. "You don’t win bowl games 50-3. Sitting here one year and one week ago, no one would believe this other than maybe me. It is just awesome to see. I am proud of these players", said Head Coach Lane Kiffin. The Owls kept the bowl market captive as the only contest on for the evening and didn't disappoint, as the running game was successful as usual, defense was stellar, and a healthy dose of pass plays provided setup spark. Despite a slow start and somewhat sluggish performance early, the contest was never really in doubt as Florida Atlantic (11-3) amassed a 21-3 lead in the first half enabled by successful fourth down conversions. They built upon that mark throughout the second half while the Zips failed to contain, score, or make up any ground. FAU out gained Akron on the night, 582-146. The Owl defense had 11 tackles for loss, five sacks and held the Akron rushing attack to 1.9 yards per carry. The Zips offense managed just 11 first downs and was 3-of-15 on 3rd down plays. "Really just an unbelievable day,” Kiffin said. "You don’t just come to the FAU and win 11 games. These kids aren’t even playing close games. It’s one thing to play a close game, go to triple overtime, but these kids just dominate everyone they play." With the win, FAU remains perfect in their bowl appearances, adding to previous wins in 2007 (New Orleans Bowl, Memphis) and 2008 (Motor City Bowl, Central Michigan). The eleven wins amassed for the 2017 season is the most at the FBS level of play and ties the program mark set back in 2003 during a historic FCS run for the Owls in just their third year. "To win 11 games, and a 10 game winning streak, this has got to be the hottest team in the country", asserted Kiffin. Conference USA Most Valuable Player and the Owls' all-time career rushing touchdown leader Devin Singletary ran for 124 yards and 3TD, surpassing Charles Pierre's 77 yard showing in 2008 for the most yards rushing in a Bowl contest. Singletary also set a new Conference USA record for most rushing touchdowns in the season with 32 after his game efforts were complete, and moved into third place all-time in FBS history, trailing just Barry Sanders (Oklahoma State, 88') and Monte Ball (Wisconsin, 11'). Signal caller Jason Driskel (photo) produced an efficient 19-of-25 showing for 270 yards and 2TD while adding 2TD on foot as well. Driskel, who was named the game's Offensive MVP, also ran for 78 yards. Linebacker Azeez Al-Shaair, who had 13 tackles, 2.5 for a loss and a sack, was chosen as Defensive MVP. Senior receiver Kalib Woods had a game best 79 yards on four catches, while Kamrin Solomon and Willie Wright added 71 each. The coaching staff will now turn their focus towards completing the 2018 recruiting class, and soon thereafter Spring Practice. "We hope to sign a lot of great players tomorrow…I think it's a great place to come", Kiffin said immediately after the contest. The Owls will look to bring in between 22-24 new players depending upon roster fluctuations. Off the field on Tuesday FAU apparently received more good news towards that effort when Kiffin was reported to have agreed to a 10 year contract, eclipsing the original deal which still had four years remaining. "They came to me with it, and we're very appreciative of it", commented Kiffin on FAU's offer. "We're changing the way people think." The Owls will officially begin their second season under Kiffin on September 1st, 2018 when the team travels to Norman Oklahoma for the first ever meeting against the Sooners.